Ok, I've been away from the blog for a loooooong time. Plenty of things have happened, both crafty and running-wise (not so much progress on the knitting!). I really have loads to show off. But the thing that's finally spurred me back online was the race I ran on Sunday with my boyfriend. 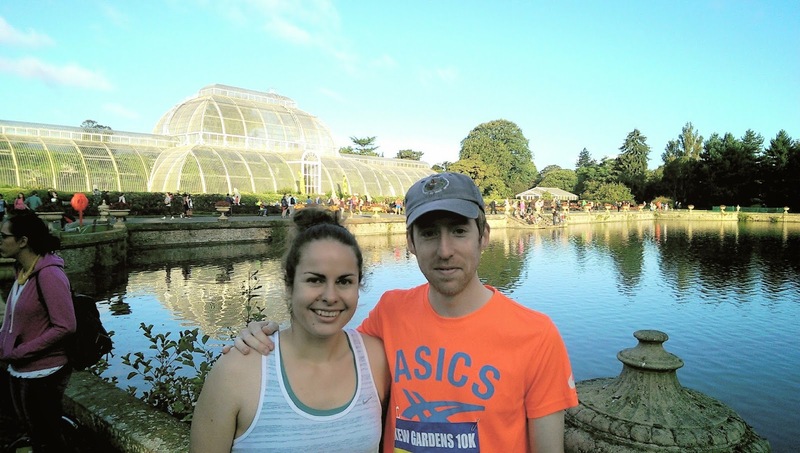 It was the Kew Gardens 10k, part of the Richmond Running Festival which also includes a half marathon, and a post-race music festival. It's only in its second year this year, but sold out. We had originally wanted to do the half, but places were already gone by the time we heard about it. The route starts in Kew Gardens, before heading out on the Thames Path along the river, finishing up in Old Deer Park. 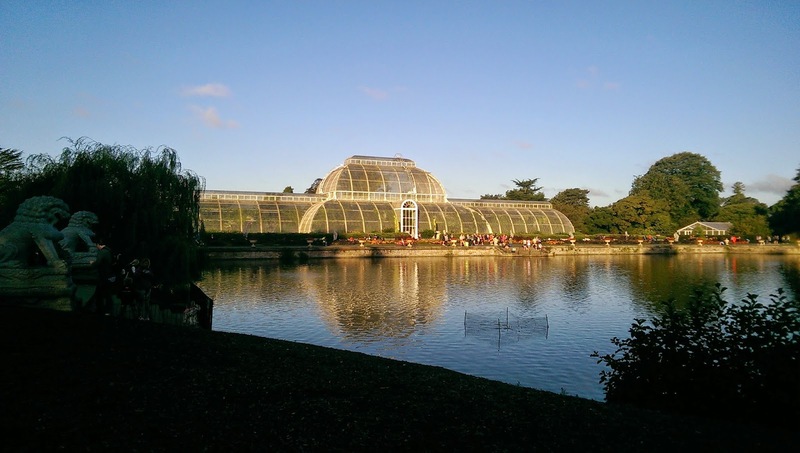 Kew is somewhere very dear to my boyfriend and I, and I bought him membership for his birthday last year so we've been there regularly. We leapt at the chance to do some running there. Getting permission must have been incredibly hard for the organisers. It was an early start, I suspect because Kew was open as normal and they had to clear the runners out before the gates opened. The first chilly morning of autumn and the promise of a beautiful day. We'd got there early as the info suggested, which meant we had plenty of time to relax in the cafe. I never need the loo before races, but it was obvious that the apparent lack of toilets were an issue for quite a lot of people. Being regulars to the gardens we knew about the location of some of the non-advertised toilets. The organisers have since apologised and explained a last minute problem was to blame for the lack of portaloos. But like I said, it wasn't a problem for either me or the boyfriend. The race started in 2 arbitrary waves, 30 seconds apart. It meant I got to start with my (super speedy) man, which seems to be such a luxury these days. I loved it. The course was perfectly big enough to accommodate the runners at the start for the 10k. Running through the gardens was such a luxury. After the gardens we turned onto the river, a route which I've run myself a few times before. I knew it would be narrow in places, and the terrain is more like a trail. Being a public footpath there were people walking against the tide of runners, which must have been hard for them. I know an oncoming flow of runners who think they own the space can be very intimidating, so I hope they were forewarned. The finish in Old Deer Park included the only hill (a slight slope) before a long finishing straight which just begged you to squeeze out a sprint finish while imagining the chariots of fire music. My boyfriend and I both smashed PBs. 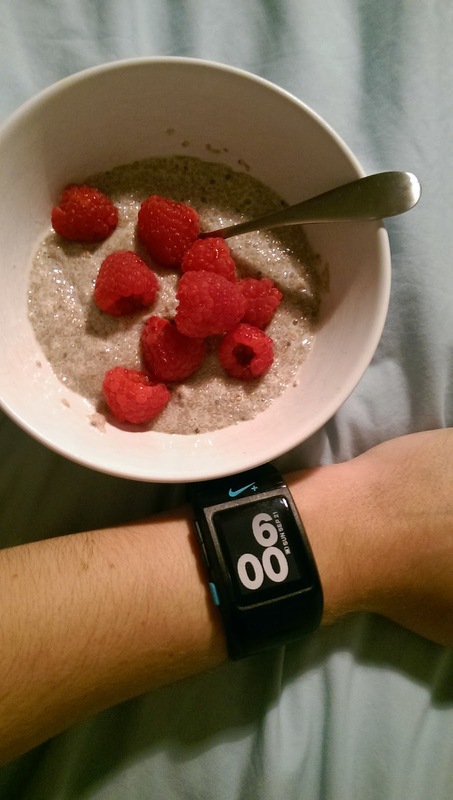 (However, while his watch measured 10k, mine measured 200m short. It still would've got me a PB though). The medal and t-shirt really stole the show though. 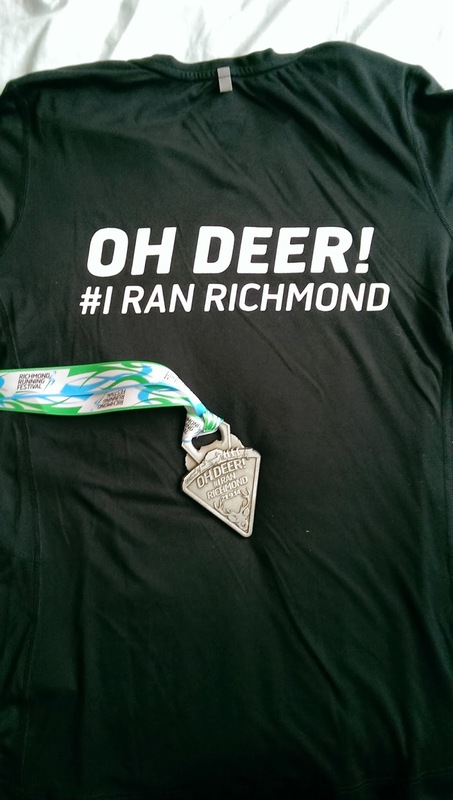 Easily the best medal and the best t-shirt I've ever seen. Put them together and that really is something to write home about. And there was a free beer. Unfortunately the festival started a bit late for us 10k'ers really. We'd been hanging around for a few hours before a couple of friends doing the half got in, and we were ready to go before any of the music started. But it was a great atmosphere in glorious sunshine, and the finishing straight was packed with supporters, particularly for the half when the 10k finishers started lining the side. The bag transfer was easy and pick up at the finish seamless, with rows neatly organised by number and watched over by marshals. I'm really writing this because the event has received a lot of stick on Facebook. Some people clearly had the complete opposite experience to us. Because for my boyfriend (who has run a LOT of 10k's and half marathons) it was the best race he's done. I certainly had a great time, and with that medal and t-shirt I have nothing to complain about. On Facebook runners complained about missing the start because they were in queues for the toilets, about the route being too narrow, about water stations only having cups, and running low on water. I think the expectations and demands of runners have become deeply unrealistic. I'm new to running, and appreciated a lot about the race. The start in Kew was something really special - possibly people don't understand that running in a world heritage site is a bit out of the ordinary. It's not designed for running, so yes the paths are likely to be narrow. There was easily room to run two abreast at the narrowest part of the towpath. As for toilets and water on the course, I feel that people have stopped taking responsibility for their own race. If you know you suffer with a nervous bladder a) do some bladder re-training and b) check out the facilities before you get there. Or get there early. Like us. As for water on the course, runners race at their own risk, therefore if you know you can't get through a half marathon without some water, take some with you. If there's water stations on the course then take some water as back-up. It's always nice being able to drink when you need it and not have to force it down too early/late. It seems highly irresponsible to go into a race without the resources to finish it. The response of the organisers to the feedback has been honest and swift. Obviously these problems will be easily remedied for next year and I fully anticipate it to be a phenomenal event. The boyfriend and I have already earmarked it as our 'luxury' 10km race for next year, to enjoy and possibly target a pb. The race clashed with the virtual 'Beat the Blerch' run (organised by The Oatmeal, and inspired by this one of his comics), and while our race pack for that arrived in plenty of time for us to have run it on the same day as the actual race in America a customs charge meant we didn't actually collect it until after the weekend. 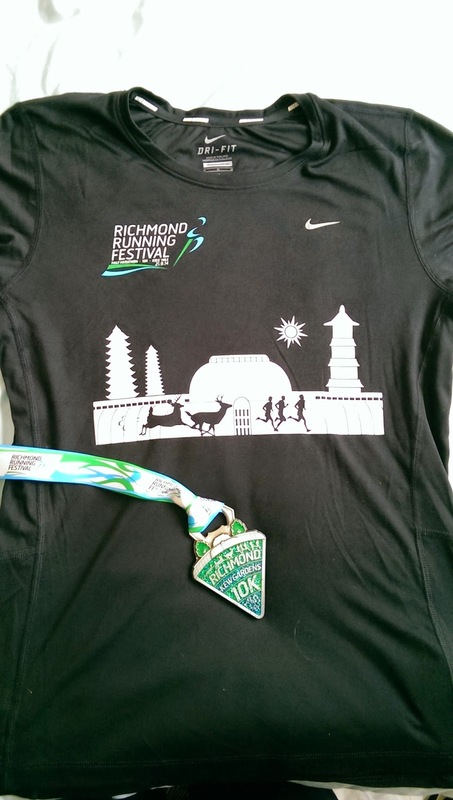 But the Richmond T-shirt now has competition for 'best race t-shirt', because the Blerch one is darn good. 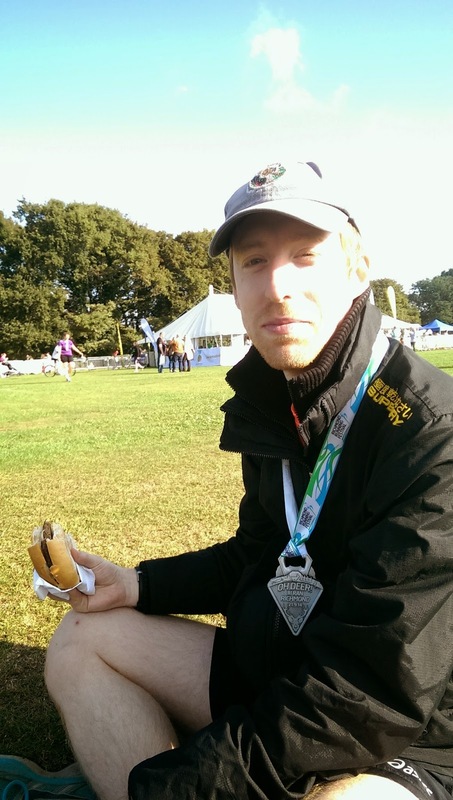 We're running our bleach half marathon in Richmond park next weekend, and will spare a thought for the family of the runner who sadly didn't make it to the end of his half at the race in America last weekend.